The disappointing news is that chemo number four coincided with the weekend of PodCamp Toronto (PCTO2010) meaning we weren’t able to be in Toronto to reconnect with longtime social media friends, make new ones and be present to learn and discuss new ideas about digital communication and relationship building. 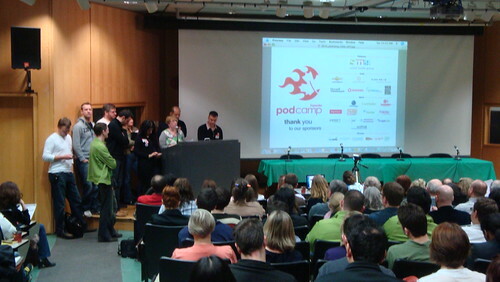 PCTO is one of the few PodCamps that live streams all of the sessions — one of the advantages of being hosted in the Rogers Communications Centre of Ryerson University (THANK YOU, MANY!). The venue is fully equipped which means we could attend the sessions from the comfort of our own house at the mercy of the camera work and quality of the streams. That’s where technology’s advantages plateau because no matter how much technology you throw at an event, whether a conference or the inaugural ceremony of the President of the United States, the technology just doesn’t exist to turn a mediated experience into a real one. 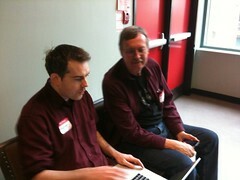 Social media unconferences have unique advantages over their formal cousins — they attract people who use technology for social engagement. This means that most of the people who attend the event have a desire to connect with others even if their own personalities or anxieties make that difficult for them. Sue Murphy captured the reason why mediated experiences at PodCamps will never deliver the goods in her post The land of the free. In it, she relates clarity she gained from a conversation — nay, an experience — with the “spiritual leader” of the Canadian social media community, Scarborough Dude. The Dude has always preached about authenticity and how the digital world can facilitate it. PCTO and events like it teach us that technology can only facilitate authenticity in digital spaces. Real authenticity can only be experienced by being there. Photos: PCTO2010 kick-off by Brad Fortner and Tod Maffin and Scarborough Dude by John Meadows.